The now traditional (two times is a tradition) trip up to Kielder for the Dirty Reiver 200 gravel race (not a race) took place last weekend. A hastily packed campervan was whizzed up the M6 (brief stop at Tebay for some carbo loading in the form of lasagne and chips), turned right onto the A bumpy A road to Canonbie, Turned right again onto the really bumpy B road to Newcastleton, turned right again onto the crater strewn, deer infested excuse for a B road to Kielder castle, hidden in a quiet corner of the car park and turned into a bed for the night. Campervans are ace. Race day dawned annoyingly early. 5am starts are rubbish (as are Forestry Commission types, hanging around the car parks to swizz people out of stupidly large amounts of money for Pay and Display tickets (rant over)), but after a spot of porridge and scraping the ice off the saddle of the bike (yes, it got cold overnight!) chatting to people on the start line seemed to make everything better again. 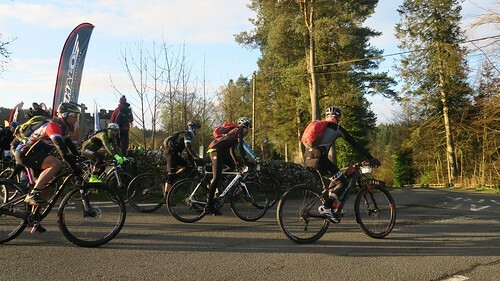 The prospect of a Big Day Out on bikes had everyone in good spirits and, after a few – perfectly toned – words from Rory Hitchens about Mike Hall, we shivered our way off into the forest as the sun started to try and warm things up a bit. The pace was pretty nippy for the first few miles (and the first wrong turn). I decided that, although Phil and I had set our sights on a sub 8hr 30min time for the route, sitting way above threshold 5 miles into the 125 mile route was a bit daft so settled into a rhythm and, as we found ourselves in a similarly paced group, remembered to start looking at the views. Unlike the last few road races round uninspiring (ugly, even) industrial estates, the Dirty Reiver is basically a tour of some of the UKs best true wilderness. If you don’t lift your head to take in the constantly changing vista, you’re missing out. Hugely. Almost claustrophobicly dense, thickly pine scented, shadowy forests would give way to hilltop panoramas of utter, blissful emptiness. Distant hills, wide WIDE open skies and total silence, all linked by the continual ribbon of crunchy gravel beneath your tyres. Fast progress across the ground was made, but dwarfed by the sheer scale of the countryside. 16mph average speed for hours before we reached the first checkpoint and a chance to realise my waterbottle had already launched itself into infinity somewhere. Bugger. Good job I had my little camelbak on as well, or it’d by a damn dry day! The group Phil and I were in, split up briefly as we took varying amounts of time getting sorted at the checkpoint, rejoined and worked well together as we criss crossed the border. Big climbs, fast descents, not-as-wet-as-they-could-have-been river crossings and the second checkpoint/feedstation (NO FIG ROLLS! FFS!) all flew past until we reached the track from Newcastleton heading back towards Kielder. Memories of suffering along the meandering trail during the Kielder100 and UK24hr races came flooding back as I saw the “13 miles to Kielder” sign. the sun was fully out by this point and, buried deep in the valley alongside the river, it was almost hot. Orr pace slowed, not through lack of effort but as a result of the condition of the trail. Bigger bumps, deeper holes, looser patches of gravel and a subtle but continual upwards drag made every pedal revolution hard work. We began to pick up stragglers from the fast group ahead as we pushed on up the path, each rider taking a turn up front to pull the pace along when feeling strong and, after what seemed like an eterniity, we reached the cut off between the two race routes. One of our group was riding the 130km course and split off with a wave as the rest of us got ready for one of the biggest climbs of the day, up to the highest point on the course. As bizarre as it sounds and despite being 80-something miles into the route by this point, I only seem to notice the scale of the ride as I head away from Kielder castle on the second loop. Maybe it’s because there are few turnings – you simply ride yourself in one direction for miles and miles away from the start/finish on already tired legs, then take a more circuitous route to get back – or maybe it’s the relative openness of this section as you’re out of the trees for most of it, very aware of the distant hills all around you. whatever it it, it’s ace. What Big Days Out are all about. I make the mistake of working out how many miles are left, instead of just getting on with it, and start counting down from 40. The countdown does not go quickly. Final checkpoint passed, with a brief stop to top up my camelbak and add some more lube to the crunchy sounding chain, I start to wonder when we’ll see Kielder Water for the first time. I remember it coming into view from last year ad how it heralded the beginning of the end of the race. I’m looking forward to seeing it again, possibly too much. I start to get annoyed that I can’t see it each time we crest a hill. We’ve ticked over 100 miles now and both Phil and I have had our bad patches and come out the other side. From a purely numeric point of view, this should be the final countdown (for a couple of climbs I get the riff from that song stuck in my head…), it should be in sight, surely! Many, many more miles are travelled before it’s first glimpse. I’ve been promising myself an energy gel when I see it and I nearly bonk waiting for it, but it finally appears just as I contemplate caving in and guzzling the gel early. Not only does it look beautiful. Not only does it signify the final section of the route, but the lakeside trail we ride is so smooth compared to the gravel we’ve ridden up to this point, so fast, so fantastically swoopy that I’m grinning like a loon as we race along it. we’re on schedule for a sub 8hrs 30min finish, the sun is shining, everything is right with the world for a while. We cross the impressive looking dam and continue on the opposite shore, now heading almost directly towards the finish line. A short road section is blasted along and the final little climb of the day is comfortably mashed under wheel as signposts for the castle start to reappear along the route. We’re within day trip walking distance now, just a last couple of fast-so-we-definitely-make-it-in-time flat miles on well smooth surfaced family trails and that’s it. We’re done. Finish line hands shaken, smiles matched, free beer gladly drunk, healthy food (OK, burgers) inhaled. Plans for next year begun. Brilliant. Yeah, I’m still here. Just being lazy with updates. Done loads of riding since the National CX Champs – road season’s kicked off again, though so far it’s been a bit of a damp squib. Missed the breaks and got frustrated by those endless “sprint for 3 seconds, turn around, look s at the bunch, sit up” attacks people do…even when you go with them and try to get something going. Never sure what they’re trying to do with those…or what they expect to see after the 3 second effort when they look round. It’s still kind of fun. Even when it pisses down and you end up shivering, despite wearing softshell baselayers, warmers and such. Character building or something. I did a fell race too – as organised by a certain Simon Fox. It was great fun. Thankfully I knew most of the route from riding round the area, so could work out where the hills would be and never felt too out of my depth. It being a night race, I imagined my 200 lumen headtorch would be awesomely bright compared to everyone elses, but I spent most of the run chasing my own shadow as people with what must have been 1000 lumen jobs stuck to their foreheads utterly outclassed me. Those same people utterly outclassed me when it came to running downhill too. If anyone ever suggests to you that there’s not much skill needed for running, punch them in the leg, from me. Even flat out I could not keep pace with people as they skipped and danced their way across the ground. Battle on the Beach went quite well. 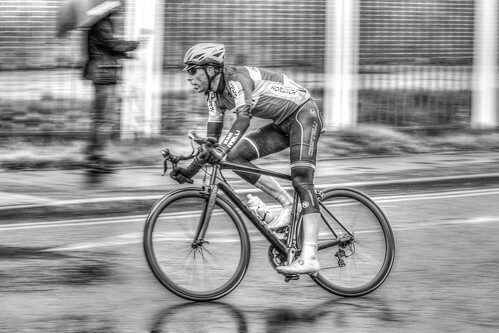 Long gone are the days of me fighting for a top ten spot in that race – with numerous foreign pros coming over and a healthy dose of the UKs big hitters turning up for the event I”m very much back in the mid pack now. Doesn’t matter, it’s still the same mix of “oh my god this is amazing” sprinting down the beach, followed by “this singletrack is brilliant” twisty turny fun to get back (then repeat, twice) and you’re still utterly flat out, racing whoever’s in front of you and trying to drop whoever’s behind you. As always, the weather was gorgeous, so a weekend at the beach felt like a mini summer holiday and the end result of 47th out of 800 or so starters isn’t too bad – less crashing and I could easily make up 10 places I reckon.